San Giorgio has stood armless and weathered atop the Basilica San Giorgio Maggiore looking towards San Marco Square since he was maimed by lightning in 2002. His job: to slay dragons and protect from the plague as well as protection of the Benedictine monks who take care of the church. But lightning cut through the thick copper plates which covered a wooden core causing the arm with the sword to hang dangerously until the local firemen removed it nearly a year later. Now, thanks to the generosity of the Swarovski Foundation’s restoration project, Saint George (San Giorgio), the slayer of the dragon once again stands armed with his sword atop the beautiful San Giorgio Maggiore. The work was completed in time for the feast of San Giuorgio on April 28, 2014. The Swarovski Foundation, was established just one year ago at the 55th Biennale in Venice, has completed their first restoration working closely with the Benedictine Monks. All work had to be done on top of the dome as it was impossible to remove the statue which meant the Venetian craftsmen spent months in the wind, rain and fog normal for Venice but making working difficult and dangerous. The team was lead by the architect Massimo Rigio along with Joseph Tamil and Alessandro Ervas. The original church on this site dated from about 790AD and the property was given to the Benedictine order by the Doge Memmo.982AD. 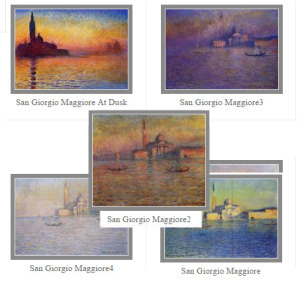 Giovanni Morosini, a Benedictine monk, drained the marshes and founded the Monastery of San Giorgio Maggiore. In 1223 the church was destroyed by an earthquake. It’s present architectual design is by Palladio who arrived in Venice in 1560 and began with the refectory of the monastery. Palladio was asked to design the new church and the foundation was laid in 1566. The interior of the church houses paintings by Tintoretto, the Last Supper and The Fall of Manna, as well as the Entombment of Christ. 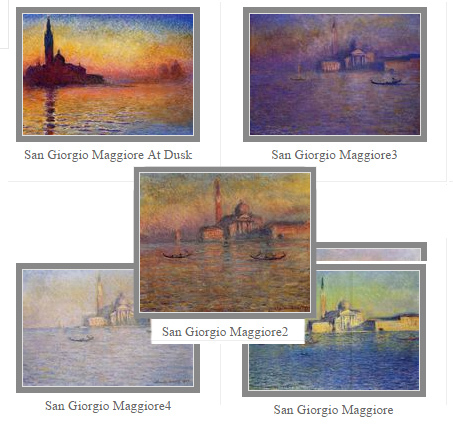 If you are a fan of Monet you will recognize his series of San Giorgio: San Giorgio Maggiore at Dust, Twilight in Venice, San Giorgio Maggiore, and San Giorgio Maggiore2 3, and 4. Visiting: It is just across from San Marco, the #2 leaves San Marco for San Giorgio on a schedule. While you are there be sure to 1) See the Tintoretto paintings, 2) Go to the top of the bell tower for some fabulous pictures of Venice looking back across the Bacino San Marco.3) Check out the yacht Club and have a snack while enjoying the amazing view.